WASHINGTON (AP) — Donald Trump confidant Roger Stone may be accused of lying and tampering with witnesses, but it’s equally notable what he’s not charged with: colluding with the Kremlin in a grand conspiracy to help Trump win the presidency in 2016. The case is the latest in a series brought by special counsel Robert Mueller that focuses on cover-ups but lays out no underlying crime. It’s a familiar pattern in Washington, where scandals from Watergate to Iran-Contra and Whitewater have mushroomed into presidency-imperiling affairs due to efforts to conceal and mislead. In the Russia investigation , one Trump aide after another has been accused of lying to investigators, or encouraging others to do so, about Russia-related contacts during the campaign and transition period. 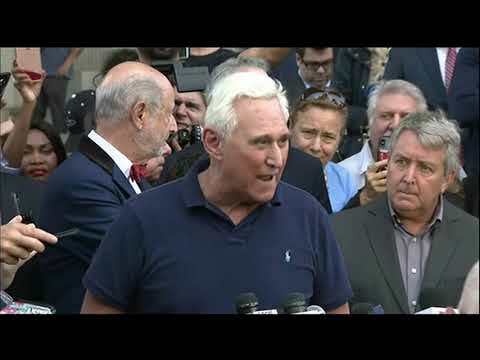 Stone’s indictment charges him with seven felonies, including witness tampering, obstruction and false statements, while leaving open the question of whether his or the Trump’s campaign’s interest in exploiting Russia-hacked emails about Democrat Hillary Clinton crossed a legal line. The Stone case is in some way reminiscent of Mueller prosecutions that have accused former Trump lawyer Michael Cohen of lying to Congress about his role in a Moscow real estate project; former White House national security adviser Michael Flynn of lying about his contacts with the Russia’s U.S. ambassador; and ex-campaign aide George Papadopoulos of lying about his knowledge that Russia had “dirt” on Clinton in the form of stolen emails. “I do think that it’s more than just coincidental that there’s all of these communications between multiple members of the Trump campaign and Russians, and efforts by members of the Trump campaign to cover up and conceal” those communications, he said.